The Merry Widow. June 8th 1907. Music by Franz Lehar and lyrics by Adrian Ross. Based on the Viennese operetta Die Lustige Witwe by Victor Leon & Leo Stein, adapted from Henri Meilhae's play L'Attaché d'Ambassade. (In some translations, 'The Gay Widow'.) Choreographed by Fred Farren. Scenic design by Alfred Terraine and Joseph Harker. Costumes by Lucile, Pascaud and Percy Anderson. Best known for the song 'I love you so' aka 'Merry Widow Waltz'. Elsie plays 'Sonia Sadoya', starring alongside Joseph Coyne, W.H. Berry, George Graves, Robert Evett, and Elizabeth Furth. The production was conceived as a 'stop-gap' by Edwardes, who confided in comedian WH Berry that he, 'hoped to get a six week's run out of it'. 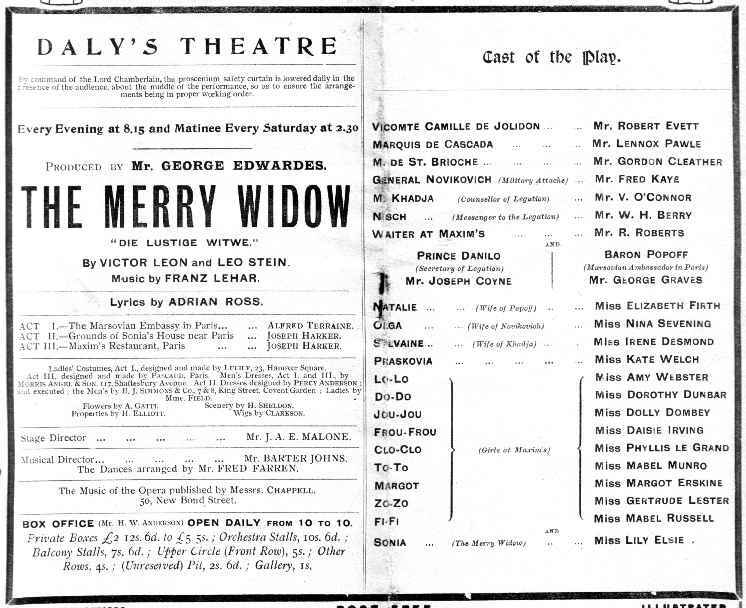 The Merry Widow was Lily Elsie's biggest success. 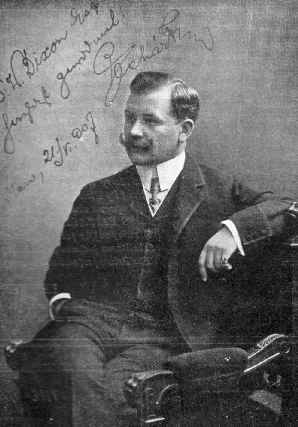 Composer Lehar agreed to conduct on the opening night, in spite of his reported dissatisfaction with Coyne's singing ability. Graves padded out his role with the antics of various ad-libbed animals such as 'Hetty the Hen'. During the run Lily Elsie was succeeded by Clara Evelyn and Constance Drever. 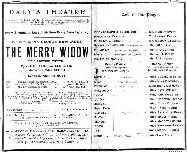 In the week of August 24th 1908 she took the rôle of the Merry Widow to the Dublin Gaiety Theatre. Then in October that same year Elsie played the part of Sonia in a production of the Merry Widow at the Princes' Theatre, Manchester. The following week she performed with the same company at the Court Theatre in Liverpool. All over the country audiences were crying out for the Merry Widow! 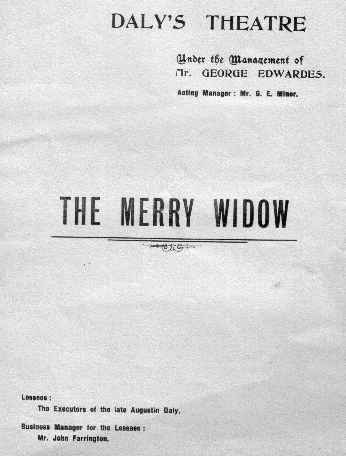 King Edward VII saw The Merry Widow four times. Among the more bizarre stores was the one about the inhabitants of the little town of Groeningen, in Holland, who were surprised one Sunday morning to hear the bells of their parish church pealing forth the Merry widow waltz.